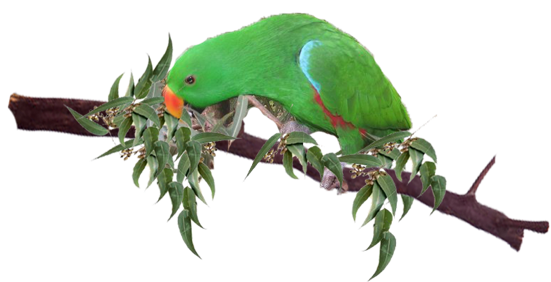 There is occasionally some debate on whether Eucalyptus should be used as chew branches for Eclectus parrots. Eucalyptus is a hard wood and Eclectus cannot chew through them. This is said to discourage them from chewing. While this may be true for some, it doesn't mean you should discard Eucalyptus all together. Some eucalyptus are harder than others so try finding the softer one. Thinner branches and twigs, flowers, leaves, bark of any Eucalyptus can easily be chewed. 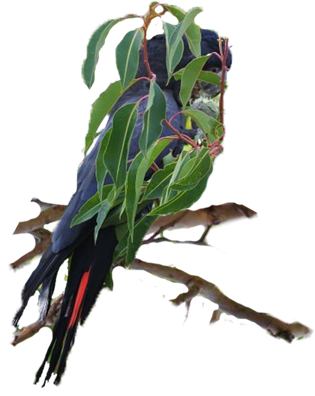 Tree stands are recommended to be made out of eucalyptus as they're strong and leaving the bark on eucalyptus means you parrot will have access to the oils when chewed which is a good health tonic for parrots. Eclectus thoroughly enjoy chewing eucalyptus leaves, flowers, flower buds, stems, bark and nuts. Eucalyptus is a readily available in Australia and branches should be made available to any parrot. In the US there is a supplier for Eucalyptus called Euc Products. There are also Eucalyptus nurseries throughout the US. Crushing fresh gum leaves gives you the eucalyptus oils. In Australia Eucalyptus is commonly used for all ailments and bugs in humans and parrots. For parrot eucalyptus can be used as a preventative for mites, lice and external parasites. Dried or fresh crushed gum leaves or fresh can be used for nesting materials to keep away mites. This is particularly popular amongst some budgie breeders. It has been studies and noted budgies in the wild line nest sites with crushed gum leaves to prevent their chicks being exposed to parasites. 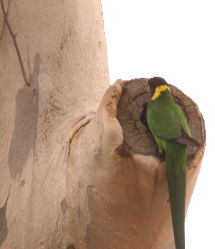 Hang gum tree branches full of leaves, nuts and flowers in your birds cage and on their stands. Your birds will always benefit from having them and can never get too much. 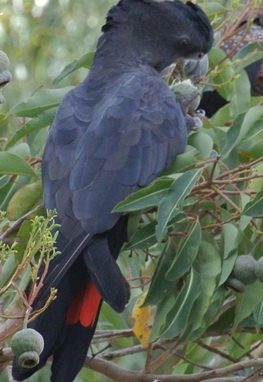 Parrots and Cockatoos in the wild have been seen to strip bark of gum trees and put holes into the trees to access the sap on a regular basis. The birds often return to these wholes reuse them over and over again. 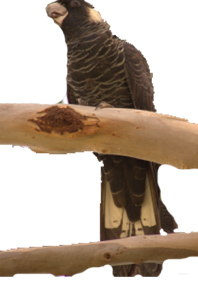 Gum tree branches are also a very safe, natural, irregularly size branch to use for perches. Eucalyptus oil from the leaves has medicinal properties which stimulates your birds immune system and can promote a strong natural resistance to disease and parasites. Crushing or chewing the leaves releases these oils. Never use gum branches, flowers, nuts and leaves from a florist. They're sprayed with insecticides. hiding amongst gum leaves and eating the fresh flower buds. There are still some people who believe and say eucalyptus is toxic to parrots or they can only have very limited leaves and branches and not flowers and nuts. This is untrue and through trying to find the source of this rumour I have discovered this information has been based on other species of animals that eucalyptus is toxic to. This is not the case for parrots. Eucalyptus branches, leaves, flowers and nuts should be readily available to your birds on a daily basis. There is no part of a Eucalypt that is toxic to parrots. The leaves contain flavonoids and essential oils, are rich in eucalyptol and cineole. was by the aborigines. They extracted water from gum tree roots and used the leaves to relieve fevers. And there are early Australian developers were able to successfully treat and cure fevers using eucalyptus leaves. Eucalyptus combats bacteria, has anti fungal and anti viral powers as well as acting as an decongestant. It is also effective in respiratory treatments. The flavonoids lower blood sugar levels and eases aches and pains by increasing the blood flow. While Eucalyptus is noted and used as a mite and parasite deterrent, this is proven effective amongst indoor birds. For aviary birds use common sense. Inspect your birds thoroughly and regularly for mites and other parasites and seek veterinary help if they're infected. Aviary birds are more susceptible to worms, mites and parasites because of high exposure to wild birds. For this reason you should be serious in proper worming rather than just relying on 'preventatives' such as this. If any bird has already got it they need proper treatment. Eucalyptus is not a cure. It is just a simple preventative. If your bird already has mites or parasites you need to give your bird proper treatment. 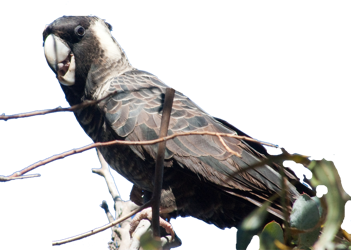 Don't rely on all your aviary birds chewing, ingesting or using Eucalyptus as it needs to be used for the prevention of these things, unless you are able to observe them outdoors 24/7. An avian veterinary once told me any wild bird that becomes infected heavily with mites, lice or parasites has either been sick recently or has a low immune system. He has not seen a healthy wild bird infected. So perhaps this is one of the reasons natural preventatives work so well in healthy birds? It just helps keep the immune system up and keeps them healthy. Another Red Tail Black Cockatoo in the same tree eating fresh flower buds. I was lucky, he let me get quite close to him.